Please be aware that you can make the images bigger by simultaneously pressing <Control> and <+>. Here's the photographs, and a few that didn't make the cut, that were included in the 2013 Bulletin starting with the Cup winners from 1971. 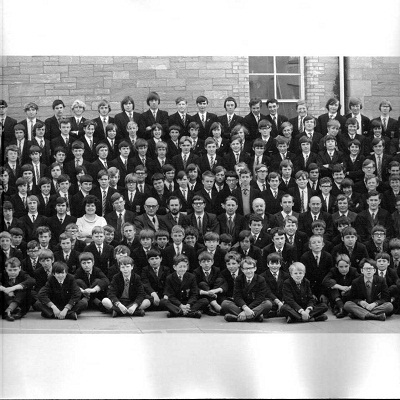 Next up is the group photo from the Rowfant Reunion. The St Austell presentation group. The Drew pictures are next. The window walking and Prefects' Alcove pictures. The book was notable for the inscription it contained. Please look here for more detail. Here's one of many team photos, which will be added in due course, supplied to me by Roy Axell. 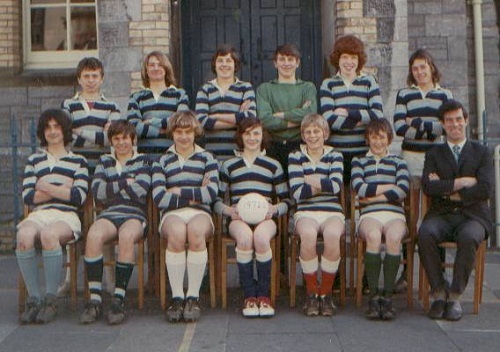 It's the 1980 U15 football team that won the schools league. Front row: Chris Creber, Mark "Lefty" Wright, Mark Lemin, Colin McEwen, Dean Hawkins, Andrew Turner. Many thanks to Lawrence Body and Steve Mannell for helping to put names to faces. 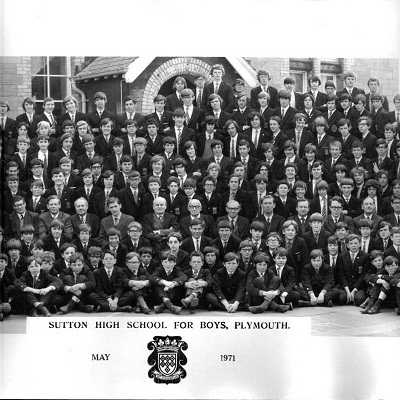 I have shamelessly lifted this photo from Neil Manley's (1977-84) post on one of the Facebook pages dedicated to Sutton High. Anyway here's a group shot of the prefects, Dr Rowe and Doug Fraser c.1984. If you can fill in any of the missing names then please let me know who they are! Back Row: M. Bailey; K. Algar; I. Coules; N. Manley; G. Williams; M. Dwyer; S. Bull; J. Kingdom. Middle Row: N. Freeman; D. Christon; I. Butterworth; A. Townsend; J. Louth; A. Saha; ?? ; ??. Churchill ; ??. Front Row: T. Edmunds; P. Tasker; A. Leigh; M. Sweett; Dr. Rowe; Mr. D. Fraser; D. Hart; I. Jackson; I. Johnson; A. Hoddinott. Many thanks to Clive Martin (1964-70) who has sent in this picture of the U14 1966-67 football team featuring: (back row) Ian Dart; Jack Martin (my brother); Ian Bird; Dave Broad; Clive Martin (me); Keith Steward; Ian Wilson; Mr Burrows (Pete? 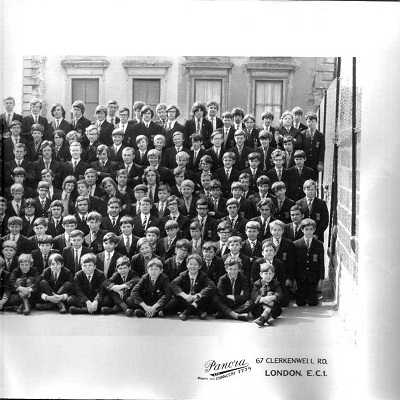 ); (front row) Dave Gosling, Bill Kingdom, Bobby Brown, Richard Luke, Trevor Deave, Dave Monk, Roger Pitcher. Many thanks to Norman Bettinson (c.1971) who has sent in this picture of one of the football teams from 1971 featuring, as far as he can recall: Phil Sprague; Kieran Mottram; Ian Gough; Ian Hannaford; Robert White; Norman Bettinson; Mark Sutton; Andy Toms; Bunny Warren; Norman Floyd; Roger Harris; David Keogh(? ); Teacher is Roy Axell. 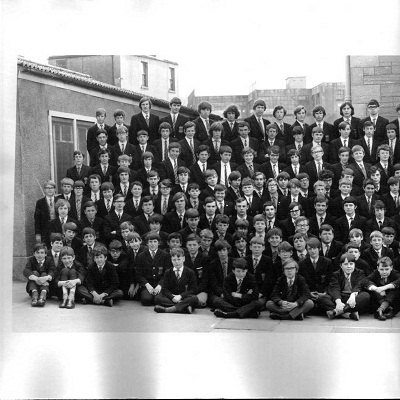 Norman has also sent scans of the whole school photograph separated into 5 sections from the same year. Obviously that image is too small to be useful so you can see a full-sized version in a new window if click here. If it is still too small then try pressing the <control> and <+> keys a few times and the image will magnify (and when you have finished <control> and <-> to make it smaller again!). Here is a scan of Sutton Judo Team. 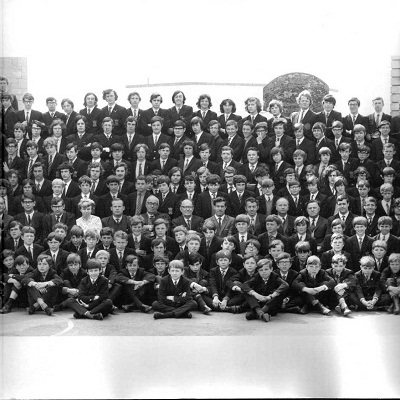 The photo was taken outside the side school door sometime around 1972 or 1973 and shows (left to right): Paul Bignell; Gary Tighe; Paul Bull; Bryan Durrant; Kim Wakeling; Martin Pearce; Michael Ough; Unknown; Dr Rowe. The Judo Team used to take on Public High School and we usually beat them. Kim Wakeling and Paul Bignell went on to become black belts. Paul Bull and I achieved the next grade under, brown belts. Several of us also represented Devon in inter-county championships. The class list is in fact supplied by Alan Weeks (his name is missing) Form 1A 1957-58 with the lovely Ray Rose as form master. The 2nd XI cricket teams include faces that I have sadly forgotten but a number of them are tagged on the Friends Re-united site. In the 1964 team I am front centre (captain) and Gordon Upham (centre back) kindly made up the numbers although he was in fact a regular member of the firsts. The teams were managed by John Perkins (affectionately referred to as Polly) and I am eternally grateful that his encouragement got me a better geography A level pass than I thought possible. The picture taken outside the pub at Shaugh Prior – 1964, is of me (centre), Bob Ferguson (left) and a friend. There were no school proms in those days but dressing up was obviously regarded as an allowable idiosyncracy of a grammar school education.